I enjoy growing challenging plants. 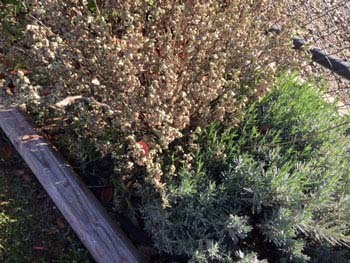 But after working hard to create a California native plant garden -- including a number of blue tag Salvias from Flowers by the Sea -- I'm worried that my beautiful dry garden is too dry. I've been extremely careful about planting in soil with good drainage and avoiding overwatering as you suggested. Despite my best efforts, the leaves of my Vicki Romo White Sage are wilting and turning yellow while other plants around it look green and healthy. I planted my Vicki Romo nearly two years ago, and it did well in my yard until this week. It looks like its dying from drought, but the soil around its base is moist. What is withering my sage, and what should I do? We are sorry for your troubles with a plant you love and have tended so carefully. Your Vicki Romo White Sage (Salvia apiana x clevelandii 'Vicki Romo') likely is dying from a crown or root disease caused by one of several kinds of the pathogen Phytophthora -- a water mold. Phytophthora molds thrive when conditions are moist. Some grow best in hot weather. The combination of water and heat is often the case in California during spring. Even soils with excellent drainage can become warm, soggy breeding grounds for Phytophthora in spring. The University of California Integrated Pest Management Program offers a detailed explanation of Phytophthora rot. UC-IPM notes that the mold's spores may survive for years in moist soil even when no host plant is present. However, the spores are likely to die after a few months if their soil is completely dry. The symptoms of Phytophthora may begin on one stem and then rapidly overcome an entire plant. To keep the disease from spreading to other parts of your garden, carefully dig up, bag and dispose of the diseased plant. Then clean your shovel blade or trowel with disposable disinfectant wipes. It's also a good idea to similarly disinfect the soles of your shoes. Place the used wipes in the bag with the plant. As you've indicated, Vicki Romo White Sage is one of our blue tag xeric plants that are sensitive to overwatering. They grow best in gritty soil that is loose and well aerated. This is because they are native to dry lands, such as the chaparral of Southern California. An icon of a water drop with a slash mark through it appears on the plant description page of each blue tag plant in our catalog. It is a button leading to more information about these exceptionally drought tolerant plants. Also, if a blue tag plant is especially challenging, we post a button that says "Degree of Difficulty - Challenging" on its description page. All of our California natives are blue tag plants, and some handle moisture better than others. However, none are up for a battle with Phytophthora. For more information about protecting dry garden plants -- such as native species -- from root disease, please read Ask Mr. Sage: How to Prevent Root Disease in Plants for Dry Gardens. If you have more questions, please feel free to call or email us. We're always glad to share information. The Salvia I ordered came in great shape, the size of the plants were large too. They are doing very well in new pots and I'll continue growing them in my green house for the winter. Love the rare salvias FBTS offers. Thank you. I am a delighted returning customer. FBTS provides beautiful, healthy plants with friendly and fast service.